ARW file extensions stands for Sony Alpha Raw, Sony RAW image file captured by Sony digital cameras. 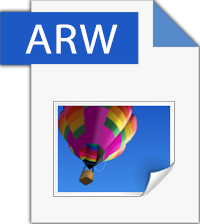 ARW file extension is used by three DSC series of Sony cameras, but the format mostly is associated with "alpha" DSLR series. ARW file format is based on TIFF format and specifications, and contains raw, uncompressed image data as is captured by camera sensors. Raw image can be adjusted using image editing software before exporting to more popular image formats as JPG, PNG, GIF and other formats, but much of this extra information that is contained in RAW file will be lost. Different models of Sony cameras may store RAW images in same ARW extension, but their format can be different. That is because ARW data is captured by camera’s CCD – Charged Couple Device sensors and these sensors can differ from each other in different Sony camera models. How to open ARW file?